Why did that happen at the very moment after president Yanukovich fled the country? I see two possibles answers here. One is that everything was planned by Russia long time before and the victory of Kiev's protesters was the occasion for this. If yes, so why this happened in 2014 not in 2004 - after a similar victory of Kiev's protesters? The second one is that nothing was planned before, but the new authorities, that got the power after Yanukovich fled, posed a thread to Russia (NATO, EU etc.) and Russia started to protect its interests. First, all major geopolitical players plan for different possible scenarios. There would be nothing strange or aggressive in itself if Russia had plans to invade and support uprisings in Donbass and Crimea. I recall hearing about the US having plans for invasion of my own country (Sweden), you can't just stand there without a plan if an unlikely series of steps unfold. Regarding this particular situation, there have been leaked documents showing that Russia had concrete plans on what to do if Ukraine had a sudden change of government, plans involving taking over certain parts of Ukraine, pretty much exactly like how things developed in reality. The reason is geopolitical. 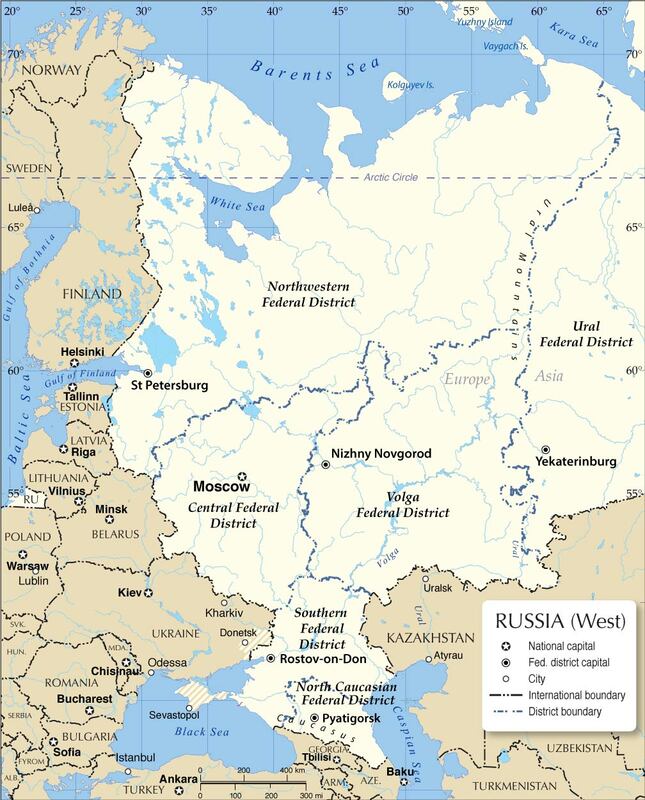 Russia used to have a strong influence over almost all surrounding countries to the west, creating a buffer zone that is very useful if you want to defend your own country without having to do the scorched earth tactic on your own soil. Remember that Russia lost about 25 million people in world war 2, compared to the 420 thousand of the US and 450 thousand of the UK. Russia intervened to make sure that Crimea would not become an integral part of an Ukraine that is firmly in the Western camp (possibly even part of NATO). They acted quite fast to preempt any possibility of provocations in Crimea leading to violence by Russian forces against civilians that would ultimately force Russia out of Crimea. Since Yanukovich's ouster wasn't done by the book, this gave Russia the room to violate Ukrainian laws when annexing Crimea. Basically, if the constitution of a country is violated and the internatioanl community accepts that, then there is no way to uphold that same constitution on other aspects where a different group of people claim their rights. When the West strongly condemned the Russian annexation of Crimea, that gave Putin a lot of political support, because the West looked extremely hypocritical in the eyes of most Russians, even those who had been critical of Putin (e.g. Gorbachov). To maximize this effect Putin needed to go ahead with the referendum and the annexation asap. One problem an autocratic leader like Putin has is that over time people can get critical of his rule, criticisms they read about in the international media will eventually peneratrate his support base. So, as time passes his support base tends to get eroded. The State controlled media cannot deal with this problem, as people will start to take anything they hear there with a pinch of salt. A remedy for that is to let the Western media make statements that are obviously false or at least seen to be wrong by the vast majority of Russians. Then with his approval rating having soared to stratospheric heights, Putin felt free to start provocations in Eastern Ukraine. Reports in the Western media about Russian involvement could be ignored because he had already immunized the Russian public from Western criticism. It has to be said that the Western media does make real mistakes that are helping Putin a lot, primarily in underreporting relevant issues. E.g. the reason why the Ukrainian army isn't doing well isn't all due to Russian superior fighting force. It has also a lot to do with the Ukrainians having to exert their authority in the territory in Donbas. The local polulation isn't always loyal to Kiev, and that makes it hard to win the conflict. E.g., the US could not control Iraq in Al Anbar province when the locals were not allowed to serve in the local security forces. Things only changed for the better when they were allowed to do that and fight Al Qa'ida. I believe, this topic has already been discussed multiple times in many articles elsewhere. I also believe, I watched a YouTube video analyzing this topic. The essence of the story is as follows. Estonia, Latvia, and Lithuania quietly got away from Russian influence during the 1990's when Russia was in political turmoil and was also struggling with its economy. Georgia moved closer to the West after Eduard Shevardnadze. Finally, Ukraine opted to join EU and NATO. This was a real concern for Russia. Russia considered it as the inception of a domino effect. This is the same reason why Russia decided to invade Georgia in 2008 when the Saakashvili government decided to join NATO. Russia was in de facto control of Sevastopol’s Ukrainian naval establishments and Russia was in negotiation with Ukraine to extend its control on Sevastopol beyond 2017 through Kharkiv Pact. If Ukraine would have peacefully joined NATO, Russian control over Black Sea would have been compromised significantly. Russia’s Taganrog base would have totally become useless and Novorossiysk would have also become weak. The second one is that nothing was planned before, but the new authorities, that got the power after Yanukovich fled, posed a threat to Russia (NATO, EU etc.) and Russia started to protect its interests. Russians always have plans for this kind of contingencies. I guess, they are also prepared for the demise of Alexander Lukashenko of Belarus in the hands of the West. A possible response would be the annexation of Belarus. If I remember correctly, they entered Kosovo in 1999 without any prior indication and then started to control Kosovo Airport and stationing peacekeeping forces in Kosovo. Finally, in this modern time, every developed or conscious country is prepared for contingencies. For instance, even though Finland is not a NATO member and apparently are in good terms with Russians, they maintain a strong modern military and are prepared for Russian invasions. To me, any way is possible here and I don't think that anyone will be able to say which one is correct for 100%. Yesterday a pro-opposition newsletter published a material about Russia's plans on Ukraine, you can read it here: http://www.novayagazeta.ru/politics/67389.html (Russian language) basically it's for your first option. Regarding why it's not happened in 2004 - IMO our government had more important problems at that time. Geopolitics are like a chess. Every country that wants to be a subject, not an object of geopolitics, needs to plan a few steps forward, preparing for various circumstances. Russia have seen herself historically as the "protector of the Slavs" and for centuries have fought for influence in Baltic Sea Basin, so Poland and Baltic states joining NATO and EU are seen as an aggression and an act of surrounding Russia. The pro-Russian Yanukovich regime has represented Russia's interests in the most vital domain, namely asserting Ukraine will not join NATO and EU. While Russia (probably) has acknowledged Poland as "lost", Ukraine joining Western block would be seen as the major strategic defeat. It's unlikely for me, Russia has planned to join Crimea and Donbas, as long as she expected the pro-Kremlin regime to rule Ukraine. They've got no rational reason for doing that. But when the real perspective of Ukraine joining Western block arose, they needed to prevent that, even at the cost of harsh economic sanctions. If such actions were planned or improvised, it's the open question, that maybe some day the historians will be able to answer, but it was actually possible to foreseen. The problem is, the West has thought in idealistic categories (the right of the nations for self-determination, freedom and democracy) and not the geopolitics ones (the right of the stronger to impose rules on the weakest in order to preserve her power). Basically, one could approach this problem by the various theories of International Policy that are, among others, the Realist, the Liberal/Idealist, and the Marxist influenced traditions, which is roughly congruent with the political triangle conservative/liberal/socialist. the Liberal/Idealist approach rejects this Machiavellian view of international policy, and puts rather universal values in the focus (bringing democracy to the world). In this view, the outer actions of states also mirror their inner political philosophy. These two are probably the more relevant ones to the conflict here, mainly because they are more influential than the Marxian views (World-systems theory, Neo-Gramscianism), so that it is unlikely that the Russian actions were motivated by them. Back to the Realist/Idealist divide: this is not necessarily congruent with the division hawks/doves. It is not unusual that Realists object to wars that are supported by Idealists! Now, often one hears the term Neoconservatives in context of American Foreign Policy; it is difficult to characterize them in those traditions, but I would propose that essentially they put an Realist agenda hidden by an Idealistic camouflage. But that would be a question on its own. Coming back to the main question, one has to first decide which of these two ideologies the Russian foreign policy establishment subscribes to. I think that almost no one would argue that the Russian foreign policy has some Idealist elements that go much beyond a clumsy cover (or, alternatively the laughable claim that the evilness of a power-hungry Czar Vladimir I. Putin in domestic politics clearly shows his evil intentions in international relations). Therefore, assuming a Realist Russian approach is appropriate here. Macroeconomic issues: Russia argued that Ukraine could not be simultaneously member of two free trade zones, one with Russia and one with the EU. The basic argument is that now Russia can guard its industries by imposing tariffs on EU-products, while if Ukraine joins both free trade zone, EU-based companies could flood the Russian market via import-export companies located in Ukraine, thereby destroying uncompetitive industries in Russia. These were actually the arguments that pressured Yanukovich to reject the European offer which led to the Maidan protests in the first place. See also the answers to this question. It is also quite reasonable to assume the Russian leadership knew what is at stake by engaging or not engaging in conflict. In the list above are several points which show that Russia has quite some economic relation with Ukraine that it would surely loose as soon as a conflict starts. Therefore, it is highly unlikely that the Russian move was preplanned and just waiting for a favourable occasion. So the conclusion must be that the Russian government looked at the situation in the post-coup Ukraine (or call it post-revolution if you are pro-Maidan), and assessed the prospects of having their interests still supported by the new government. As the political leaders of the Maidan were pro-European or pro-Western (Klitschko was sponsored by German political foundation, Yatsenyuk directly by American think tanks), the outlook was dim. Especially the fact that Yatsenyuk publicly denounced the leasing deal of the Sebastopol naval base by the Russian marine surely has spawned major concerns in the Russian military establishment, see also this answer. In my opinion this was really the tipping point for the annexation of Crimea. The possible counterargument for this is the swift reaction of the Russians. However, these scenarios are all planned and played through in the foreign policy think tanks. An striking example is the following report (pdf) of a so-called Policy Game at the German Körber Foundation, which considered the opposite case of western Ukraine becoming separatist upon the Yanokovich government joining the EAU. EAU means here the free trade zone with Russia. The Körber Policy Game “Crisis Management in Eastern Europe” was held against this backdrop in Berlin from May 3 to 4, 2013. The discussion was based on a hypothetical three-stage scenario. In this the Ukrainian government, which is faced with a faltering economy, feels compelled to join the EAU. The decision leads to mass protests and to a declaration of independence by the ten oblasts to the west of Kyiv, which now call themselves “West Ukraine.” The participants in the Körber Policy Game were four national teams (Germany, Poland, Russia and the US), each of which included between four and six high-ranking politicians, government representatives and experts from the respective countries. In internal team sessions they discussed the interests of their countries and devised tactical and strategic recommendations to take action that were subsequently discussed with the other participants in the Körber Policy Game. To me this document is an eye-opener that really shows that just a few months before the Maidan the Great Powers discussed openly how their strategies and reactions would be if an event similar to the Maidan and the Donbass separatist movements would occur. So surely the Russians thought about the prospects of their future interests as soon as the first Maidan demonstrations occurred and weighted them after an intervention in Crimea. So some planning obviously took place beforehand, but the events seems to me clearly been triggered by the Maidan uprising. a move of Russia loosing a knight after been confronted to a Gardez? One is about the influence of Vladimir Putin, his view of international relations and his policies. He has established an increasingly tight control on power and seems increasingly devoted to a form of nationalism. From this perspective, Russia isn't the same than ten years ago. Russia always considered Ukraine as part of its sphere of influence and perceived recent developments as a much bigger threat. It's not pretty but it's not particularly unusual for (relatively) powerful countries, cf. the US role in Central America, France's role in some African countries, etc. As long as you maintain your influence and no other strong player tries to dispute it, you don't need to become militarily involved, with all the costs and risks involved. But things like the Ukraine-EU Association Agreement or talks of joining NATO were too much for Russia to swallow. In 2004, there were already talks of getting closer to the EU but nothing like a specific agreement. There's another reason. Main reson, which wasn't mentioned in other anwers. Putin isn't working for Russia. He is working for himself. There's no difference for him - would Russians live good or not. The only think he want is to save his and his friend's loop. And, as you can see, after Crimea annexation his rating strongly grew up (to 80% from 60%). That's why he did. I think first off, Russia did not start an "aggression" towards Ukraine. The highly western-biased media have propagated this message for so long that it is now quite irritating. Let me say at this point that I have no allegiance to any side, but credit myself as a keen observer of Global politics. Now here's the situation, Ukraine's elected president at the time had two possible directions for expansion of their economic program; build relations with the EU or strengthen ties with Russia. Although the two are not exactly exclusive it made sense to pursue one over the other. The general opinion of the population preferred the EU option and a small percentage (mostly the Russian speaking Ukrainians) preferred the Russia option (bear in mind that both relationships would have had a positive effect on the economy anyway). When the Russian option was picked, that's when the protests began. Fast-forward to April 2014, President Yanukovich, who according to international law is still the legitmate president of the country, requested help from Russia, call to which Russia responds. There are alot of underlying issues which I haven't mentioned as that would take me off-topic here, but understand that as others have hinted, this is a highly strategic game of Chess and every move is very, very calculated. Black Sea Fleet - that is the main reason. Black Sea Fleet is very important to Russia as it protects its southern flank from NATO - Turkey, Romania and Bulgaria have Black Sea ports, US Navy and Royal Navy ships often visit Black Sea too. Russia cannot afford to jeopardize Black Sea Fleet readiness by abandoning its home port. There is no way that NATO-associated Ukraine would let the Russian Black Sea Fleet continue to use Sevastopol. The current lease agreement between Ukraine and Russia, the Kharkiv Pact, though valid until 2042, could be attacked by a pro-western Ukrainian government on the basis of it being unconstitutional. Without Sevastopol, the fleet has no place to anchor, take on provisions and refit, as other Russian ports in the Black Sea are not equipped to handle the tasks that Sevastopol handles. The officially stated reason - need to protect Ukrainian Russians from Ukrainian nationalist paramilitary groups like the Azov Battalion - is also important as the perception of protecting Russians abroad is important for Russian voters and thus for Russian politicians, but the main reason is the Black Sea Fleet. I use the memoirs of the "Strelkov" (Russian military leader in Donbass). He said that he did not receive help from the Kremlin. All the help was from Russian people from Russia. There were no Russian special forces - the commanders were ordinary soldiers or former sergeants. There was one officer who got a vacation, but came to Donbas. All the ammunition was from the former Ukrainian warehouses. Later there was a deal: Strelkov lost power and returned to Russia, but the militia received military supplies from Russia. In fact, in the midst of the hostilities Russia did nothing. Donbas militia did not receive military equipment. All the "Russian T-90 tanks" are trophy Ukrainian. Putin received Krim, but gave the Donbass to Ukraine. "Strelkov" - Former FSB colonel Girkin Igor Vsevolodovich led rebels in the city of Slavyansk, and later headed the forces of the "people's militia" in Donetsk. From May 12 to August 14, 2014 - the commander of the "armed forces of the Donetsk People's Republic", from May 16 to August 14 - the defense minister of the self-proclaimed NDP, from July 6 declared himself "the military commandant of Donetsk". Field Commander number 1. On April 15, a group of servicemen from the Dnepropetrovsk 25th Airmobile Brigade crossed over to the side of the militiamen along with military equipment (in all, six BMD-based vehicles, including one self-propelled howitzer mortar, Nona) appeared in the militia. This Nona - a real legend! я призываю к СРОЧНОМУ ОКАЗАНИЮ МАСШТАБНОЙ ВОЕННОЙ ПОМОЩИ. Она не поступает. Через неделю-другую (а то и раньше) может последовать военный разгром значительной части вооруженных отрядов ДНР и ЛНР. 1st, because it became necessary, as their henchmen Lukashenko got deposed (even deposed legally with a parlamentary majority) and having Russian Berkut sniper units on the roofs shooting at people couldn't turn the tide, and Ukraine was therefore no longer doing exactly what Russia (read VVP) wants, and they had no democratic majority that wanted to join Russia, because Ukrainians strongly wanted a European living standard, not a Russian one. Which meant they couldn't retain their fleet (and air)-base in Sevastopol, as Ukraine moved towards NATO membership (a step which had previously been prevented by Germany). 2nd because they could, since Germany has vetoed Georgian and Ukrainian NATO membership (in 2008/2009 I think), therefore those countries had no immediate/official military support, and their own military is too weak. Furthermore, because as of that moment, Russia now had both the money & reason to do so. 4th, because VVP has been nurturing a rather extreme form of nationalism in Russia, and with the "Arab spring" making headways into the east (and the KGB/FSB unable to prevent it even with the usage of force of arms), and VVP's popularity falling dangerously low, he had to do something to get those approval ratings up again. 5th, because VVP is not working for Russia, but into his own pockets. Around the Krimean, there are huge gas fields, which have now been transfered to Gazprom for free (despite being worth billions). Guess who owns appx. 4% of Gazprom and is therefore inofficially one of the richest people in the world (if not the richest) ? You gessed it, it's not Bill Gates, it's the chief of the Krishka, Vladimir Vladimirovich Putin (VVP), former chief of the KGB & godfather of the SPB mafia. You expected anything better from a ruthless guy like this ? I guess when Putin has finished with the Ukraine, we are about to experimentally find out whether NATO membership of the Baltic states is anything more than a paper tiger without funding. Not the answer you're looking for? Browse other questions tagged russian-federation international-relations geopolitics ukraine armed-conflict or ask your own question. Why did Russia default on its domestic bonds in 1998 when it could simply print money? Why are the exemptions for travelling from Ukraine to Crimea so narrow?